What these Chippewa Men's 20076 Brown EH Steel Toe USA-Made Wellington Boots lack in laces, they make up for in American ingenuity. Manufactured in the USA, these lace-free beauties are packed with safety features to keep you operating at peak performance levels. A ... (see full details) (see specifications) #CHP20076. What these Chippewa Men's 20076 Brown EH Steel Toe USA-Made Wellington Boots lack in laces, they make up for in American ingenuity. Manufactured in the USA, these lace-free beauties are packed with safety features to keep you operating at peak performance levels. And when you're not on the clock, cowboy boots have a great way of putting extra swagger in your step. Chocolate-brown Apache leather was used to create the smooth uppers. The distressed, weathered look adds a touch of character that makes these men's boots look well-traveled even when they're brand-new. Work up a few good horse stories to go with them, and people might even think you're a real cowboy. The flexible, stretchy leather helps keep your stride smooth, making every step easy and effortless. Drill vamp lining adds fabric to the shaft of each of the leather boots, providing a soft barrier between your skin and the durable leather. The 5 Iron Texon insoles in these Chippewa boots further provide flexible comfort, adding soft cushions to make every step more comfortable. The Stockbridge Vibram outsoles are made with a tough, slip-free tread pattern that resists slick surfaces and wet floors, keeping you on your feet. The tough tread is also resistant to oils and other workplace chemicals, so it'll stand strong against corrosive chemicals. Goodyear leather Welt construction is used in these steel toe boots to stitch the rugged uppers to the durable soles, giving you reliable, long-lasting Chippewa footwear. 4 iron midsoles and fiberglass shanks help you remain stable on your feet all day, even after ropin' and ridin' 'til sunset. This footwear has been crafted for excellence and is rated for resistance to electrical hazards. What's that mean? When you come across open electrical circuits, these brown boots will actually protect you by absorbing up to 600 volts of dangerous shock. The steel toes have been approved for ASTM safety standards to guard you from dangerous impact and crushing falling hazards. Who says you aren't a real cowboy? When you've got the right men's footwear, you can go ahead and be anything you want. 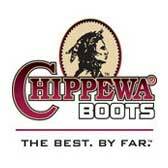 Order these Chippewa Men's 20076 Brown Steel Toe USA-Made EH Boots online from the Working Person's store today? Get you a piece of American craftsmanship you can work in these Chippewa boots all day long with no problem. I have had these for a month now with no problems at all and I like the fact they can be resoled I am very had on boots. I work in a industrial place and my first pair lasted over two years it was time to replace them just because they were old but still going, would recommend these Chippewa boots to anyone their durability is without question. I've been a big Chippewa boot wearer for many years and this boot doesn't disappoint. Holds up to wear as good as any, but most importantly, is extremely comfortable. Sizing is accurate. These are well made boots and do not look bulky like some work boots. I'll buy these over and over again when I want a fresh pair. I was skeptical about buying boots online, but was very pleased with these Chippewa work boots. Started wearing them the first day I got them and they provided a great fit immediately, I wear them to work everyday now. Chippewa Boots: Men's Brown Steel Toe 20076 EH Wellington Work Boots is being added to your cart.